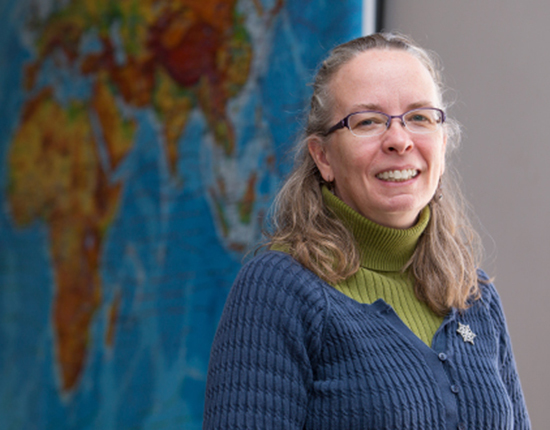 Predicting the future is the stock-in-trade of a meteorologist, so perhaps it’s not surprising that Professor Teresa Bals-Elsholz knows to expect a certain event every year in her atmospheric dynamics course. Valpo students are smart, and they’re hard workers, but learning the difficult equations that abstractly describe complex moving systems can be something of a slog. “The first semester is sort of like laying out all the puzzle pieces,” Professor Bals-Elsholz says. “But then there’s that moment in the second semester when all of the pieces suddenly come together — when all those cumbersome equations suddenly make sense, and they understand how the jet stream works. I stand in front of the class writing equations, and they race ahead of me. The enthusiasm of Professor Bals-Elsholz and her colleagues is infectious, and she can gauge their success by the eagerness of graduate schools and employers to snap up their graduates. “We teach our students theory, and how to apply it. Crossing that boundary is how you learn to think critically, and those skills are valuable in any setting,” Professor Bals-Elsholz says, noting that graduates of the department are successful in a wide range of fields. The department’s enviable facilities also help ensure that graduates are well-versed in the tools of their trades. Valpo meteorology graduates have found work in the field as researchers and forecasters, both on and off TV. A number work for regional offices of the National Weather Service, in emergency management, and in private firms that provide forecasts for businesses on which weather has a major impact. Professor Bals-Elsholz is often called upon to suggest job candidates.